Making the most of ‘time’, I’ve been doing some seasonal Spring Cleaning… therapeutic. Going through the cupboards, I found that we had rather a glut of polenta. So to correct the balance of ‘store cupboard essentials’, we had a polenta evening, trying lots of different polenta dishes. Here are the top two: Orange polenta cake steeped in fruit syrup, & Mushroom herb polenta – more tricky to make, but an education in polenta cooking if like us you’re not familiar with it. I have to say, I always just thought of polenta as something which lacked good looks and taste, even when served in the smartest restaurants, and never really ‘got‘ it..! 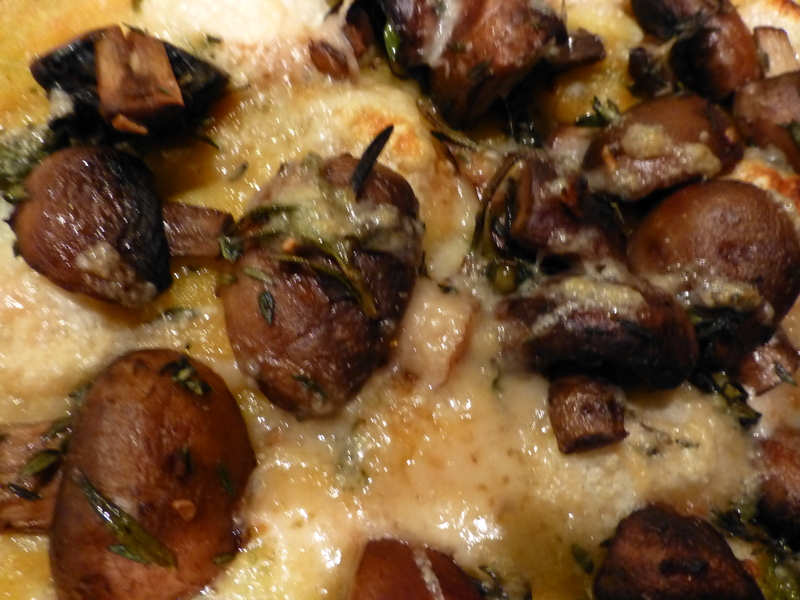 Ottolenghi’s Mushroom, Herb & Polenta ‘Pizza’. Orange Polenta Cake with orange syrup. Mushroom Herb Polenta; like a homemade pizza. Bubbling with mushroom juices, grilled cheese & fragrant herbs. 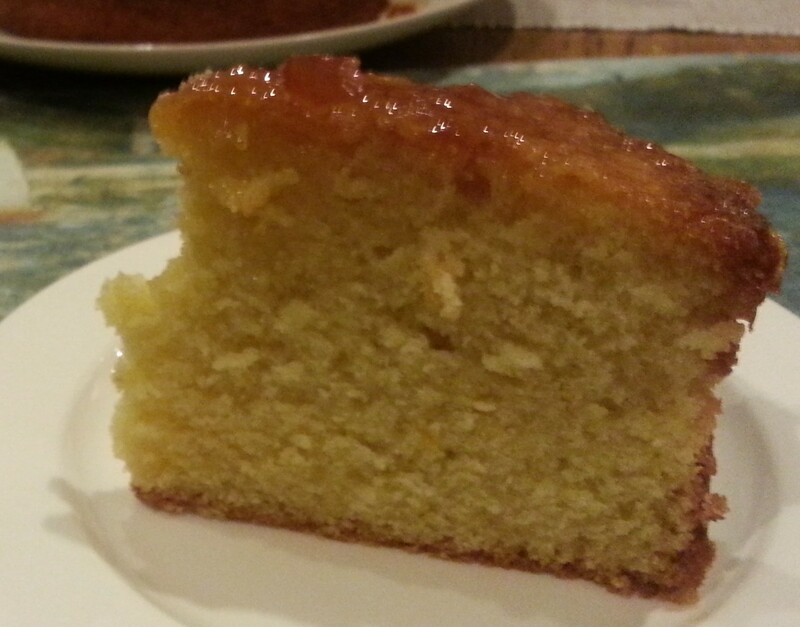 Orange Polenta cake; lovely for desert with a dollop of creme fraiche; equally good for tea the next day. Ottolenghi’s Mushroom & Herb Polenta. Vegetarian. We found it best to let the prepared polenta rest a little before use, allowing it to settle. I’d love to hear what other people do with polenta – do let me know (I’ve still got quite a stash in the cupboard!) We used thyme and sage in this recipe, as they both needed trimming ready for their spring growth! Orange Polenta cake with Orange Syrup. Vegetarian. Grated zest and juice of 2 large oranges. Grate gently or the zest will be bitter. Save 100ml juice for syrup. Orange Syrup – 100ml orange juice and 100g sugar. Line a round 23cm cake tin with baking paper. I used a smaller tin with only 2/3 of the mixture and it was perfect, so adjust carefully to suit your needs. Heat oven to 160 / 140 / gas 3. Cream the butter and sugar until pale and fluffy. Gradually add eggs, beating well. Feel the burn in those arms! Reserve 100ml juice for syrup in a small saucepan. Add the rest, with zest and dry ingredients to the creamed butter & sugar, sifting in flour and polenta. Gently plop into the tin and smooth the top. Bake in the oven for around 45 minutes, or until a skewer comes out clean when inserted into the centre. Make the syrup by gently dissolving sugar in remaining orange juice over a low heat, stirring occasionally. Once dissolved, bring to the boil then simmer for 5 minutes to reduce & thicken slightly. Slowly pour the syrup over the cake, allowing it to seep in. I did this before taking the cake out of the baking paper, to stop the syrup from running off. Allow to cool on a wire rack. Enjoy – some people won’t like the texture of the polenta, but I think it’s quite sophisticated… I’m going to try this again in late summer, with lavender flowers in the syrup to give it a more floral aroma. Recipe from the fab BBC good food website. What’s your favourite recipe website? 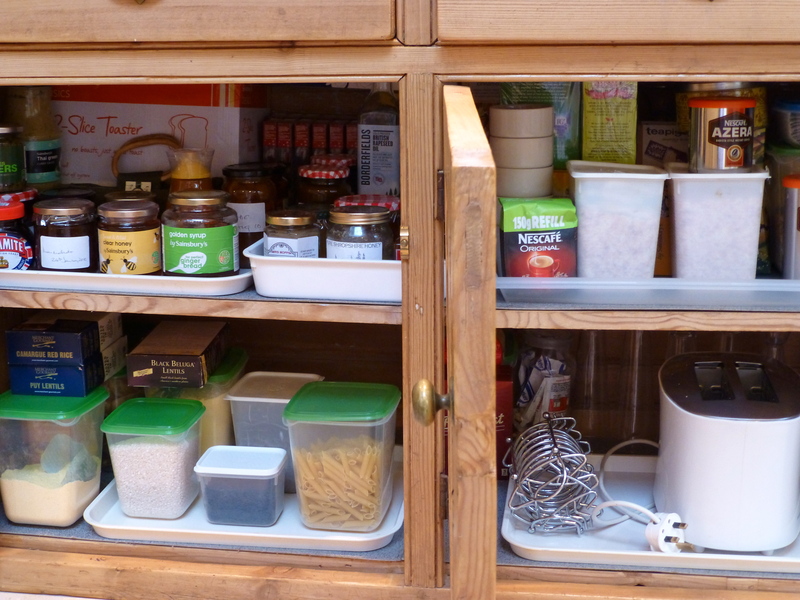 So for the moment, my kitchen cupboard is sorted, but it’ll never be ‘tidy‘!